No bones about it. This past year has been KidGlov’s biggest, best and most exciting ever! From Nebraska to Colorado, we’ve been kicking up brands and creating names. Thanks to the top dog brands we partner with and our brilliant people, here are eight great things we have to celebrate from 2018. KidGlov Colorado launched August 2017. In 2018, we worked with Colorado Thought Leaders Forum, Downtown Loveland Partnership, Greeley Center for Independence, Uncommon Solutions, Brillity Digital, Palermo Power, Meals on Wheels, Great Plains Health Regional Medical Center and Anytime Fitness of New Mexico just to name a few. Kelley Peterson and Johnny Hyde were on the road presenting to AMA Denver, AMA of Northern Colorado, Colorado Nonprofit Association, Science Made Fun and our own Nonprofit Marketing Workshop. KidGlov Omaha was established in 2017 and moved to Downtown Papillion in 2018. We were pleased to grow our relationships with Immanuel Communities, Regency Shopping Center, Dreamweaver Foundation and PromiseShip while starting new relationships with Papillion Community Foundation, College of Saint Mary and Boys Town. Kelley Peterson and Lisa Bowen have been very busy doing a series of presentations for Nonprofit Association of the Midlands, Sarpy County Chamber of Commerce and our own Nonprofit Marketing Workshop. 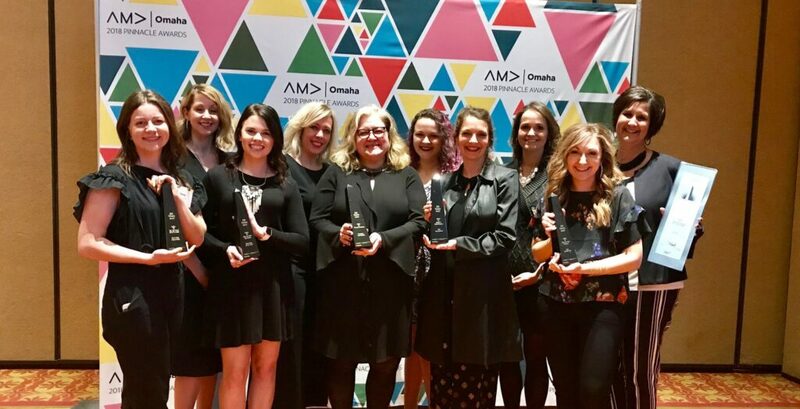 Our work for a variety of clients was recognized by Nebraska Addys, Omaha AMA Pinnacles and Lincoln AMA Prisms. Plus, as the 2017 Omaha Pinnacle Best in Show Winner we were asked to head up the branding of the 2018 awards show. Our most valuable resource is our team. Jen Landis was awarded an Inspire Women in Leadership award for Entrepreneurship and accepted into the NMotion Academy for her work on PinCurl Girls. I (Lyn Wineman) was also humbled to be named the Lincoln AAF Silver Medal winner for Lifetime Achievement – which was an awesome excuse to buy an amazing pair of shoes covered in buttons. Marie Ostarello, Creative Director, Colorado (Technically Marie accepted our offer on the last day of 2018 and started in January. We LOVE having her on board. While we are always advancing brands, these brands underwent a major shift with a new name, logo and/or tagline: PromiseShip (The new Nebraska Families Collaborative), HopeSpoke (The new Child Guidance Center), St. Monica’s, National Association of Case Management, Baylor Evnen, Mapes Industries, Uncommon Solutions, Palermo Power and Brillity Digital. Last but not least we celebrate our new relationships. There’s nothing we like better than advancing brands and we couldn’t do it without them. In addition to the brands above, we also started working with Downtown Lincoln Association, Lincoln Partnership for Economic Development, Food Bank of Lincoln, College of Psychological and Neurological Pharmacists, Houses of Hope, Lincoln Electric System, Seifert Leadership Development, Nebraska Press Association and CAFCON. Momentum continues into 2019. We’re out of the gates strong with new brands, new websites and new people. We can’t wait to see what this year (Year of the Pig) brings.